In late April 2017, Condor and Bandit took a trip to London to see the sights and do a spot of shopping. While in London it seemed like a funny idea to visit Barking and take a photo in pup hoods so they could be barking at Barking. One jaunt halfway across London later and they get the photo, which was very swiftly posted to Twitter and Telegram. Condor and Echo with the Pup All The Stations totem. Once the mirth had died down, someone asked if they were going to do more photos at more stations, which Condor pondered if they could. While Bandit wasn’t up to the challenge of visiting every station in the UK, Condor thought it might be a giggle to see just how many could be done. 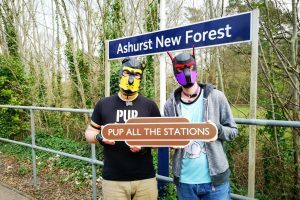 Thus the project of #PupAllTheStations was born – even though it didn’t receive its name until a few stations later during a conversation on Telegram. The name started as a Twitter hashtag for ease of finding all the stations visited, but as more stations were visited Condor wanted to see all the stations on a map – which prompted the creation of this website. And yes, fans of Geoff Marshall and Vicki Pipe’s “All The Stations” adventure, the series was the inspiration behind the name. It started as being a tongue-in-cheek reference, which then stuck. The difference is, Condor is actually getting out at each station (where possible) – which is why this is going to be a very slow project. The Twitter hashtag isn’t just the domain of Condor, however, and if permission to use other pup’s photos can be obtained they shall also be added to the map. Eventually, the map can be almost like a database of puppy invasions of the British rail network and beyond (yes, international stations are welcome on the map). Feel free to use the #PupAllTheStations hashtag if you want to submit your own pictures to the Twitter stream, and eventually Condor may get in contact to request permission to use your photo on the site. What Counts As A Station? Tram stops that are street level (akin to bus stops) are yet to be decided upon. Of course, this list might grow but for now that should be enough. The main target for Condor, however, is to get all the National Rail and London Underground stations. The rest will be bonus points, or left up to other pups to conquer. Why Pup All The Stations? The railways in the UK are amazing. They provide a vital link between communities, allowing people to connect to parts of the county they might otherwise not be able to get to. While road travel dominates, driving can be a tiring and stressful experience, and it’s not something that can be done by everyone. Rail travel, however, is open to all. Letting the train take the strain as you relax and enjoy a view of the world from the window. From the daily commute, to a quick pleasure jaunt – the railways are there to take you where you need to go. Of course, the famous closure of 1/3rd of the network by Dr Beeching back in the 60’s has reduced the number of stations and lines available, but there is still a vast network left to explore. So why not explore it? So, as all pups like walkies, it seemed like a good idea to go and explore the network. From the major passenger routes connecting big cities, to the smaller branch line stations maintained by the communities and “friends of” groups. Every single station has a little piece of history attached to it and a story to tell. While this blog might not be telling those stories it can certainly document the adventures of Condor as he attempts to visit every single station on the network, getting a pup photo in all of them. And as other pups around the country also travel by train, why not let them share their photos and journeys via their social media pages, which can then be linked to? There are a lot of human pups in the UK, and what better way to have a day trip, or go on holiday to somewhere in the UK than by train? Condor has captured every station on the the Isle of Wight, as well as the famous Llanfairpwllgwyngyllgogerychwyrndrobwllllantysiliogogogoch station. He and his fellow pups have visited small request stops like Dilton Marsh and Lympstone Commando, had a signal box tour of the decommissioned box at Brading station on the Isle of Wight, experienced many a fantastic local public house for light refreshments, and explored some of the least-used stations on the network. None of this would have done without the #PupAllTheStations hashtag on Twitter becoming a thing. It has given him an excuse to go out and explore new places, see the sights, and experience all sorts of different trains, and interact with different people along the way. And if he can do it, any pup can. As the Rail Delivery Group says, Britain runs on rail. So if you’re a human pup why not grab your hood and go visit a station? Life is all about making the most of what you have, so even a trip to a station just a stop or two down the line can become a day out when you make it one. Especially when the weather is nice. Get on a train, go somewhere (doesn’t have to far) and just enjoy the day out. Grab a photo of your puppy self and the station sign, and then share it on Twitter using #PupAllTheStations so we can see what you’re getting up to and where you’ve been. And if you have a good experience while having your adventure, tweet at the train companies and let them know. They deal with so much misery via Twitter from angry customers, why not share with them something about travelling on their trains that you have enjoyed? Everyone loves good feedback, so why not take a moment to thank the people who work hard to help us have these adventures? So why not join us? Come out and (as Geoff Marshall and Vicki Pipe might say) have an adventure.